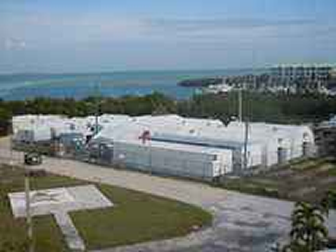 The Keys Overnight Temporary Shelter (KOTS) was created in 2004 by the City of Key West, to provide shelter and showers for about 150 people each night. SHAL began operating KOTS for the City in October 2011. The facility is comprised of seven temporary structures on Stock Island behind the Monroe County Sheriff’s office at 5537 College Road. Each month at KOTS, SHAL Shelter Operations serves over 300 individual (non-duplicated) clients who are provided with soap & hot showers and a clean, quiet, safe place to sleep and recover from a stressful day. No drugs, alcohol or weapons are allowed and bags are checked upon entry. As many as 40% of SHAL Shelter clients work full or part-time, and SHAL encourages their employment with perks such as a small secure storage space, early lights out in the separate workers dorm, late entry and other procedures to assist them in working toward finding permanent housing. KOTS does offer both men and women’s facilities with more than 10% of shelter clients being women. KOTS is designed to be a temporary stop on a homeless person’s return to independent living and many of our clients use KOTS temporarily and make the transition back. SHAL Shelter and SHAL Outreach work individually with a growing number of clients to help them in their journey to permanent housing. The Shelter hosts a growing number of SHAL services each month including the Visiting Nurse Association and Monroe County nurses; AA meetings; Financial Education classes; Employment postings; SHAL Outreach services and more. 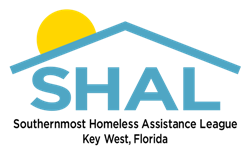 SHAL is committed to a collaborative approach to addressing homelessness involving the City of Key West, Monroe County & other governmental organizations, non-profit service providers, private businesses and the public at large. KOTS is managed by SHAL Shelter Director Mike Tolbert. Gates open for intake 6:30 p.m. 365 days per year. Gates close for intake at 9:00 p.m. Drugs and alcohol are strictly prohibited. Clients may leave at any time, but may not re-enter until the following day. Wake-up is at 6:30 a.m.
Clients must depart by closing at 7:30 a.m.
KOTS is located on Stock Island behind the Monroe County Sheriff’s Office campus. From US1 and North Roosevelt Boulevard, go east on US1 to the traffic light at College Road. Go north on College Road approximately one half mile and turn left at the sign for the Monroe County Sheriff’s Headquarters. Bear left and go past the entrance to Sunset Marina. Keep the fence on your right and the Sheriff’s building on your left as you go west past the Sheriff’s helipad. The entrance to KOTS is on your right.